These Mini Eggs Chocolate Chip Cookies are the perfect easy snack or dessert for Easter! 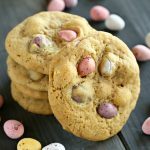 Made with the perfect soft and chewy chocolate chip cookie dough and stuffed with delicious candy-coated Mini Eggs, these cookies are beautiful, colorful, and perfect for Spring! Cream the butter and sugars together in a stand mixer on high speed (or in a large bowl with a hand mixer) until the mixture is smooth. Add the vanilla and eggs and mix well until combined. Add the flour, salt and baking soda and mix on low speed until combined. Add the roughly chopped Mini Eggs, reserving a few pieces to press into the top of each cookie after they're on the baking tray. Drop by the tablespoonful onto a parchment paper-lined baking sheet and press a few Mini Eggs pieces into the top of each cookie. Bake at 350 degrees Fahrenheit for about 10 minutes or until the tops of the cookies lose their shine on top. Allow to cool on the baking tray for 5-10 minutes before removing to a wire rack to cool completely.